May has been full of unexpected events and changes! I have not been able to post blog reviews and video tutorials as frequently because we are working on a special project that will launch late this summer. I also took a quick trip to New York for the launch of Sephora-exclusive YSL Black Opium fragrance, and that's where I first unveiled my new hair color by my superstar stylist Guy Tang! We decided to neutralize the cooler blue tones from the fuchsia and create a smoky redwood shade to give my hair more luster. As much as I love having bright and vibrant hair, I wanted to go back to a more natural look for the summer. 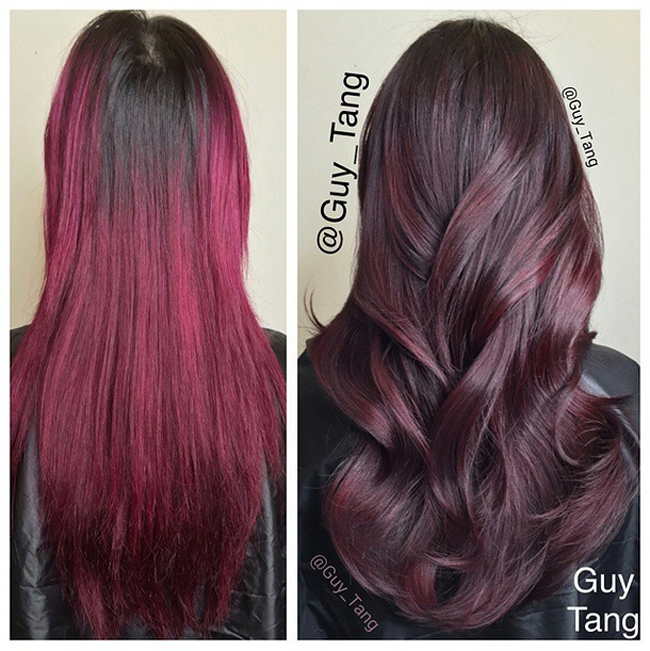 Since Guy curled my locks with my go-to T3 Bodywaver above, I wanted to show you how the new color looked straightened! It has been ages since I have felt comfortable with straight hair, since most ombrés look best with curls, but I am loving the ease of the T3 Single Pass 1.5" Iron. Curling my hair is fairly quick, but nothing beats the convenience of straightening my hair! It's so fast and requires zero effort when the proper heat settings are used. Plus straightened hair makes my ponytails and buns look sleeker, perfect for third or even fourth day hair styles! My hair is frizzier than it has ever been due to all the chemical processing, so I have been allowing my hair to air dry and then styling it the next day with the flat iron. This routine saves me the extra step of having to blow dry, and the effect lasts for a few days, so it prevents my hair from incurring too much damage from heat styling. Try to extend your hair styles with great tools and good hair care!